Seven billion people mean seven billion smiles. Caring for each and every one is at the heart of dentistry, which is the medical practice of seeing to oral health. Dentists are thus concerned with the prevention and cure of oral diseases and conditions, as well as the maintenance of oral well-being. A trip to the dentist is often associated with fear for the young and even the not so young. To many, there is pain and discomfort attached to the idea of being seated at the dentist’s chair, and of being submitted to the dentist’s assortment of tools. This anxiety even goes as far as an absolute phobia coined “odontophobia” or “dentophobia.” To ease this anxiety, clinics should assure anxious clients of their dentists’ competence. 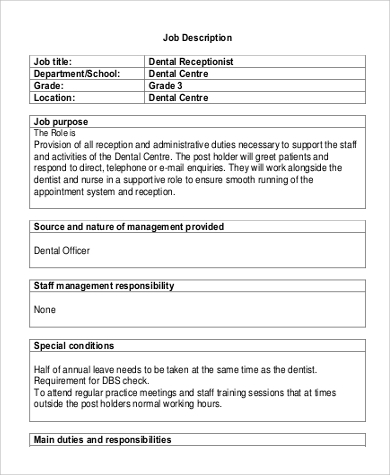 To get only the best dentists, search and hire well with the help of these Job Description Samples. This anxiety for dentists may lead to graver dental and medical complications. Refusal to seek dental help for an urgent oral condition due to fear could worsen the problem. 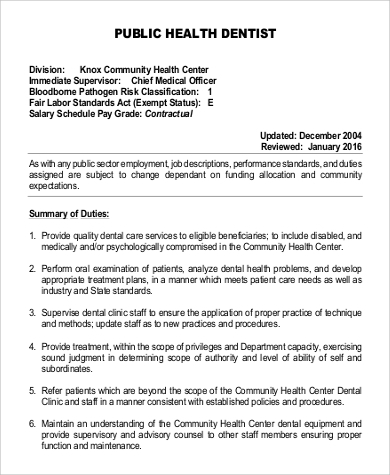 This is a serious issue faced by many, which makes it more important to uphold a good standard for dentists. To work in dentistry, one must be well educated and trained in the field. A practicing dentist has earned a bachelor’s degree and has passed a nationwide licensure examination. 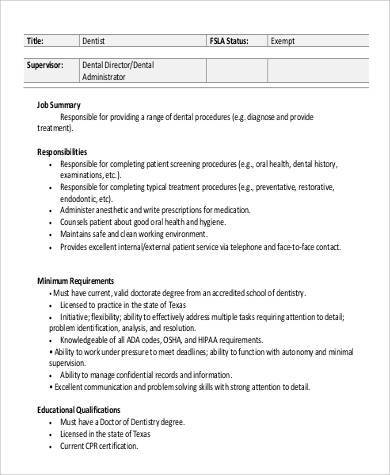 Additionally, he or she must have at least one year of residency or practice. Ask for these in your job descriptions. Maintenance. Under which are cleaning, monitoring, regular checkups, as well as preventive procedures. Treatment. This includes x-rays, diagnosis, corrective measures, root canals, and other surgical procedures. 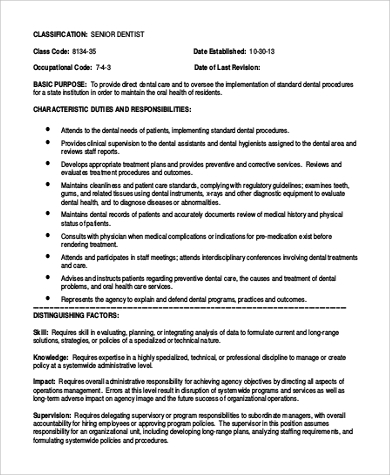 Educating patients on proper dental care is also a responsibility of dentists. 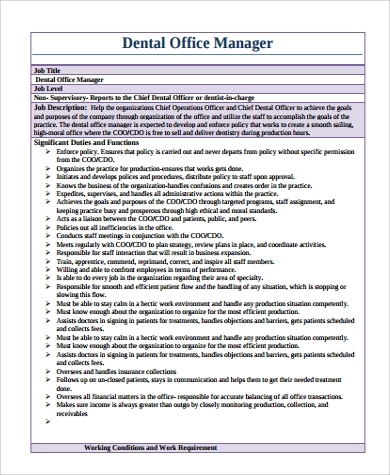 List the specific duties expected of them on the job descriptions. A pleasant bearing will help diminish the fear that most people carry into dentists’ appointments. While expertise and skill are paramount, there are plus points to doing the job with a great attitude. 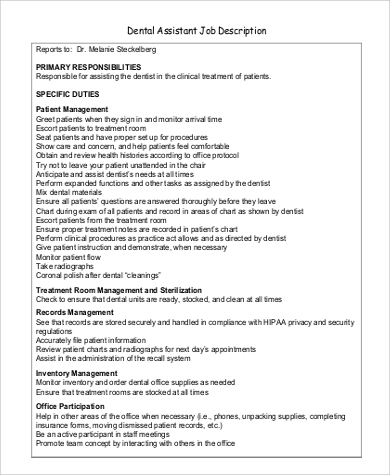 Dentists could practice in their own offices, or in clinics that they share with several partners. 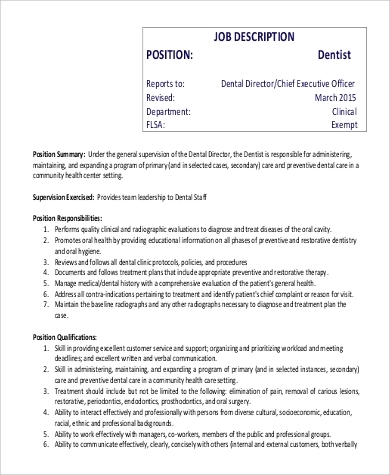 See samples of job descriptions for other positions in dental clinics on this post. 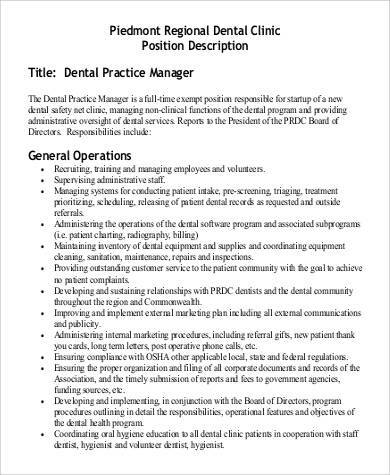 For additional reference, see Dental Assistant Job Description Samples. The work that they do, which includes the ones listed above and in these templates, encompasses all these fields. 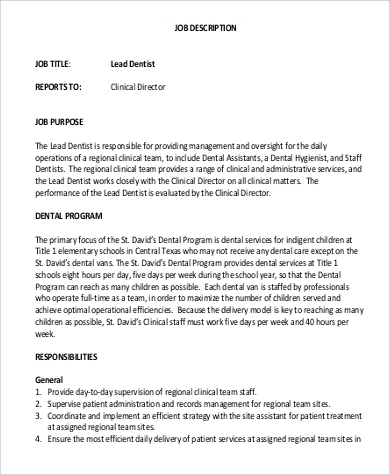 Like in the Job Description Templates above, state your clinic’s vision, and how the dentist you want to hire plays a role to its achievement. 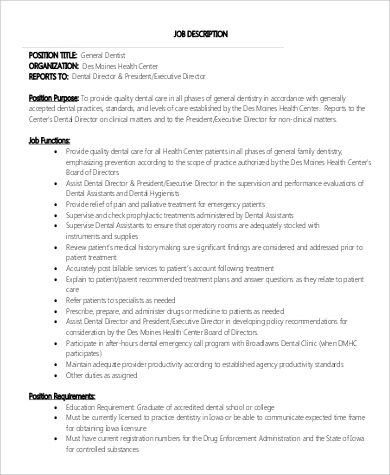 Thereafter, expound in detail the qualifications that he or she must possess, as well as the responsibilities a dentist could expect to take on while working with you.